We can now announce our panel for the special recording of the podcast from the Ask The Experts Theatre at BVE North on Nov 13th at 10:30am. Russ and Mike will be joined by Paul McFadden and Dean Covill. Paul formed Bang Post Production in 2006 with Doug Sinclair. Paul first worked with Doug 20 years previously and continued his apprenticeship with sound supervisor John Cochrane (“Tomorrow Never Dies,” “Tomb Raider II”) while Doug, looking for a new challenge in the early 90s, joined Paul at Taran - a studio renowned for its innovative approaches. Paul was then snapped up by picture editing house POV as head of its new sound department - a prestigious role for someone so young. 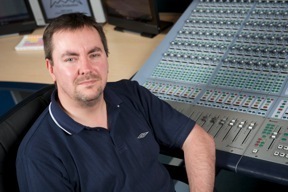 In 2004, Paul became supervising sound editor for the hugely successful revival of the BBC’s “Doctor Who.” Since then Bang Post Production has gone from strength to strength and have included various productions from the Doctor Who franchise including “Torchwood” and “The Sarah Jane Adventures.” Away from time travel, Paul’s credits include “Sherlock” and currently they are working on “Law & Order UK,” “MisFits,” “DaVinci’s Demons” and “The Machine.” He is also a guitarist, loves music programming and plays in a band. Dean is a professional sound editor and re-recording mixer. After gaining his operator qualification from Avid, he started working immediately on a freelance basis. To date, he has increased his presence and reputation within the industry by undertaking work for a broad range of clients, earning many repeat contracts. He is a firm believer that hard work gets you far. Alongside his growing work schedule he has maintained a lecturer position for a university, where he inspires and trains others into the industry. His most recent noteworthy experiences include heading his first feature film named “Tash Force,” reversioning over 350 episodes of “Coronation Street,” ADR mixing on “After Earth” and “Fresh Meat.” Last but not least, three of his projects have been premiered at the Cannes Film Festival. He is also soon to be a qualified expert within Avid Pro Tools. If you are coming to BVE North and have a Pro Tools related question, come and see us at the Ask The Experts Theatre in Nov 13th at 10:30am. If you cannot make it, we will be having a Show Bar Meet up on Tuesday 12th November at 13:00, so if you have a question or you want to have a chat then you can seek us out at the bar.